It’s been one of those mornings so far. I tripped down the stairs leaving the house for work, so then decided I could console myself with some Starbucks. On my way out of Starbucks, I thought the door was open and it wasn’t, and slammed into it, in front of a whole crowd of people waiting for their coffee. Gooooood morning, folks! Luckily, there’s nail polish to lift my spirits. 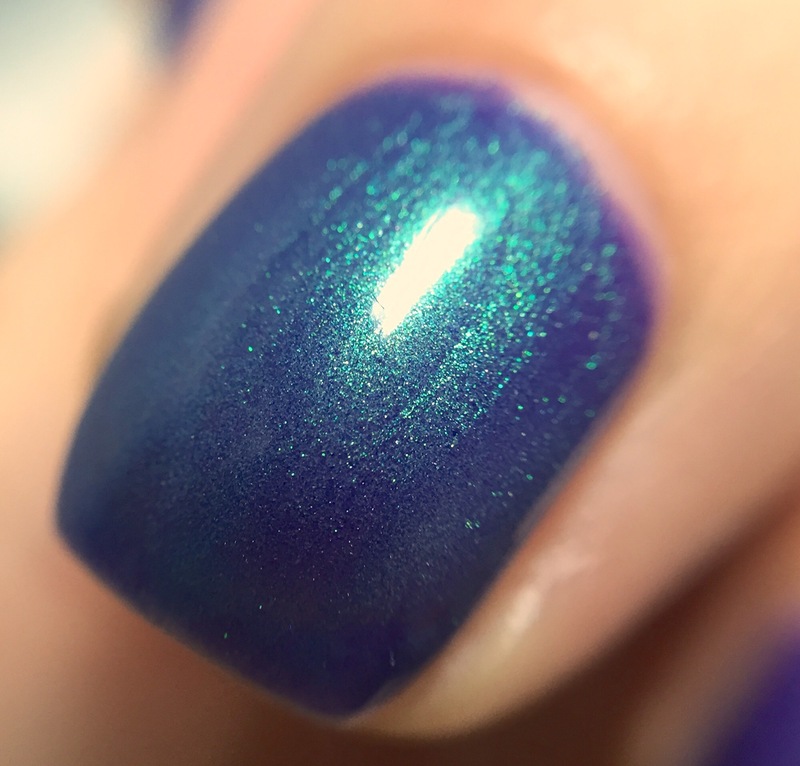 Today I’ve got a polish that I’ve been eyeing for more than a year, and I finally got it. 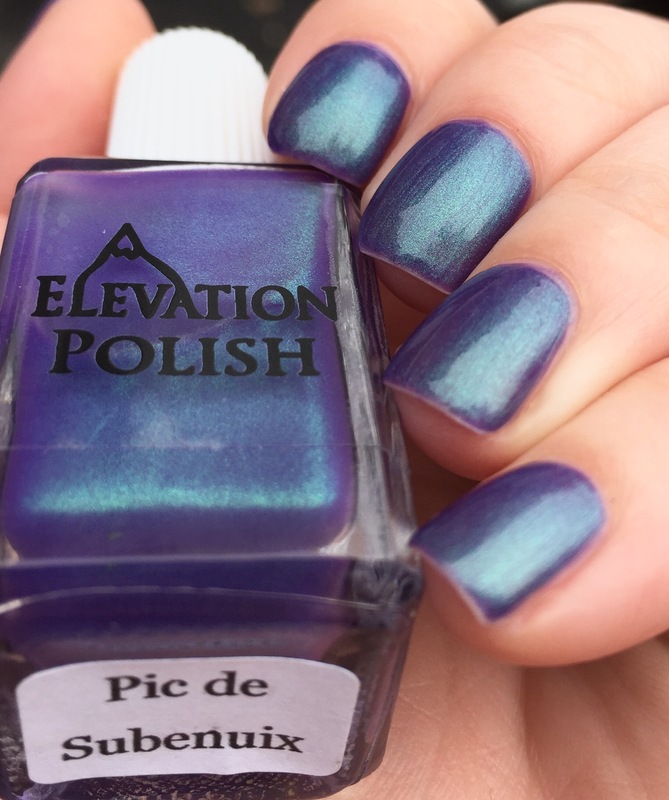 This is “Pic de Subenuix” by Elevation, a lighter purple packed with green shimmer. This is a bit of a chameleon- leaning lavender in the sun and more blurple indoors. I included pictures in different light to give you a sense. The formula here is a bit sheer (for me personally), which I think helps facilitate the awesome amount of shimmer. This is three coats plus topcoat. Has anyone seen “The Pirates of the Caribbean” movies? In one, they talk about the “green flash”- a bright flash of green at dusk as the sun sinks below the horizon line of the ocean. THIS is what I imagine the green flash looks like. I may have been wearing sunset in a bottle last week, but now I’ve got dusk too! Are you addicted to shimmer? An Elevation fanatic? Really into purple? You can pick up “Pic de Subenuix” and any of its brethren (sistren? Do polishes have a gender in English?) at Elevation’s website. Oh I love that. Do you think it would layer over other colors well? Hem, maybe? It would probably be a great base for stamping or vinyls. I love the green flash. I’ve actually seen that flash you talk about when vacationing in Jamaica as the sun goes down. Love the depth of this polish. It’s a real thing?!?! That’s so cool! I figured it was movie magic. I love this one! I generally avoid 3 coaters whenever I can, but it looks like it is well worth it with this beauty. This is one of my favorite elevations! Beautiful mani! Sorry you had such a rough day, I hate it when that kind of stuff happens to me too. Lucky for us we’re polish girls and we have beauties like this to cheer us up. 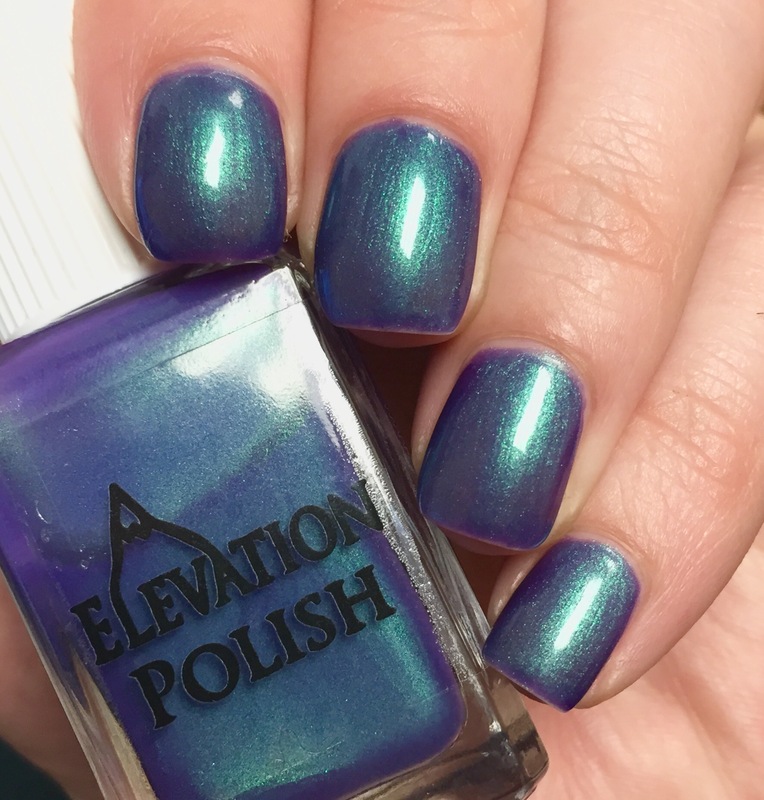 This is such a gorgeous polish, I love the subtle color shifts. You sound very clumsy like me 😉 nice polish!